Trump is in power, and one of his first acts has been to gag government agencies. After the National Park Service bruised his ego by retweeting a New York Times tweet showing Trump's inauguration numbers to be lower than President Obama's 2009 crowd, they were ordered to stop all tweets, including scheduled ones. The USDA went silent for several days, and an email ordering them to cease "news releases, photos, fact sheets, news feeds, and social media content" until further notice. As of this writing, they have not tweeted since January 18th. The USDA's Agricultural Research Service account has only tweeted once. Other agencies have gone silent or become considerably quieter. It's eerily quiet on formerly chatty government social media accounts. 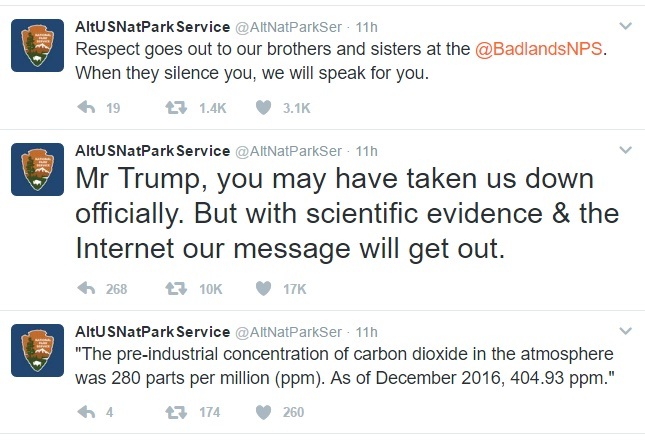 The National Park’s tweets were retweeted thousands of times before they were suddenly deleted later Tuesday afternoon. You can see screenshots of the rogue tweets at the above link. These federal employees speaking out now understand that science is not subordinate to politics, that truth is essential, and transparency vital to a functioning democracy. They are risking their careers to ensure the public is kept informed. They're exercising their free speech rights to ensure we know the truth. I have never been prouder of our National Park Service than I am now. Please follow them on Twitter. Retweet their climate change data. Support their efforts. Get the word out. And support your National Parks by donating and volunteering. Tell your elected officials to support the NPS. Take a moment to thank NPS employees during your visits. They have never needed us more than now. We will protect our public lands. And we will still be here long after Trump and his disastrous administration are a bad memory.